Happy New Year! 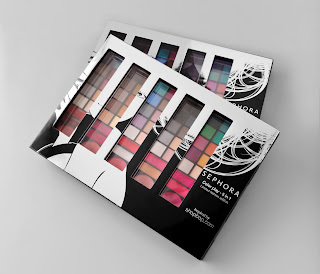 Now that the holidays have come and gone, it's time to treat yourself to some gifts, like the SEPHORA COLLECTION Color Play 5 in 1 limited edition palette inspired by Shopbop.com's "Faces of Fashion" editorial look book. The set includes five distinct color palettes, each with ten eye shadows, two lip colors and one blush in color stories that correspond to five iconic figures in fashion. This palette is perfect for on-the-go and comes with a portable mirror compact. Just select one of the five different looks/palettes and pop it into the portable compact. 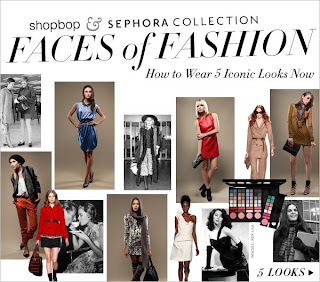 You can check out these iconic looks at Shopbop.com. The Color Play 5 in 1 palette retails for $30 ($125 value) and is currently available on sephora.com. 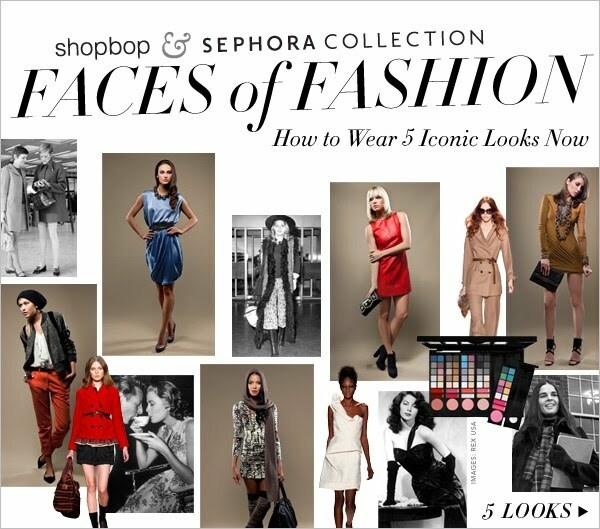 Be sure to enter the the Shopbop and Sephora Faces of Fashion sweepstakes through February 2nd, with a chance to win a year's supply of makeup from Sephora and a $2500 shopping spree at Shopbop.